Review I've always wondered what people who pay more than £2,000 for a Windows laptop are thinking when they boot the machine. It's a bit like paying a fortune to gain admission to a secret and exclusive members club, only to discover once you're in, that it's run by the bloke who does the pub quiz on a Tuesday night at your local... and all the bar regulars you thought you'd paid to avoid. "Oh... hello, Windows. Fancy seeing you here. No, go on, tell me that unfunny story I've heard a hundred times before." Sumptuous and slightly absurd, Microsoft's Surface Book is the most expensive laptop you can get, short of ordering a 24-carat custom gold plated jobbie. Sony never had much trouble shifting £2,000 Vaios and Microsoft has cracked it. Redmond claims to have $4.2bn extra cash in the coffers thanks to the Surface line, which is now widely imitated. You could argue (I won't, but you might) that Apple's oversized iPad Pro is Cupertino's response to the Surface – or a hedge against its continuing success. 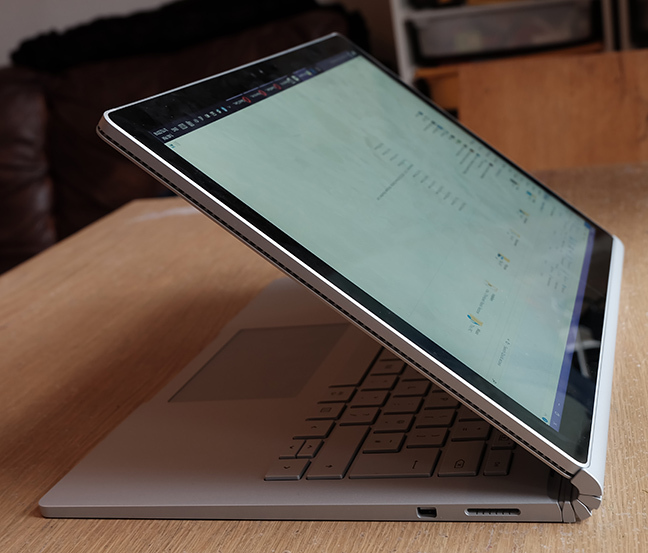 The Surface Book is a quite different proposition to the Surfaces that have come before it. It's bigger, with a 3200x2000 (267ppi) 13.5-inch display; this beast weighs 3.34lbs or 1.5kg. And its own lavish custom keyboard, which houses an Nvidia graphics unit, and an extra battery. 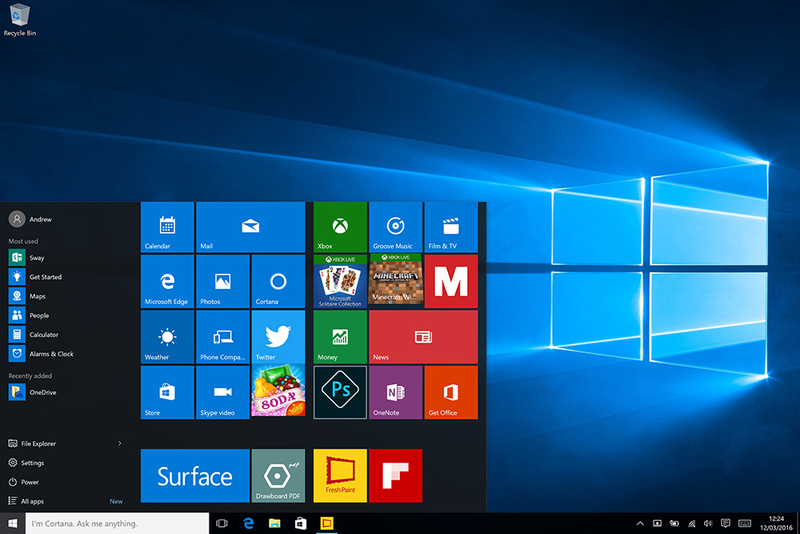 An Nvidia GPU isn't an option for all Surface Book configurations, but it is in all the i7 configurations, and was in the model reviewed here. The inclusion of a GPU means you can't just yank it out – the software you're running might be using the Nvidia card, so there's a strange little dance where you wait for confirmation that it's OK to remove the Surface from its keyboard. It's the graphics card, a rarity in laptops for years now, that gives it gaming and professional media editing chops. The display itself is dazzling and the sound superb. 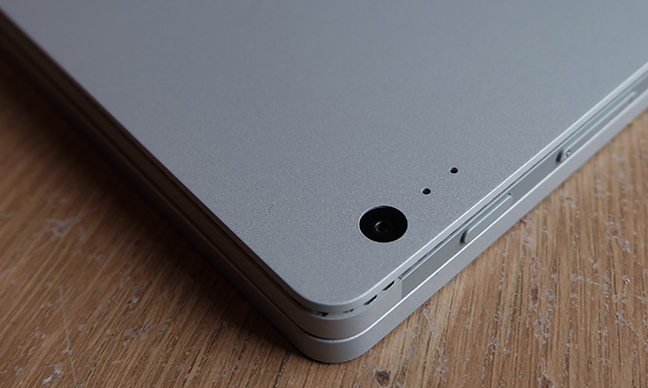 What gives the Surface Book its distinctive look – the wind blows through when it's closed – is the hinge. The trick here is using a shape memory alloy that can shape and contract. It doesn't fold back flat, which is where the other trick comes in: the machine is reversible. Lift it out, rotate it 180 degrees, and drop it back in. You've got a display tablet with the keyboard still attached. There's a dedicated Eject key for removing it, with an LED that is red if it thinks yanking away the Nvidia GPU will cause the software problems. Because the keyboard is weighted (the battery takes care of that), it shifts the centre of gravity back, so the hallmark "woah it's going to tip backwards" that characterises all prior Surfaces doesn't apply here. The keyboard itself is absolutely stellar for typing. The keys have a deep and firm travel, and bounce right back at you, a little like the famously clacky IBM Model M keyboards used to do. But quieter, obviously – it doesn't sound like a hundred rat traps going off at once. The Surface Book's keyboard has a key for the Context menu and weirdly, an Alt Graph (Alt Gr) key, a throwback to pre-GUI IBM PCs. 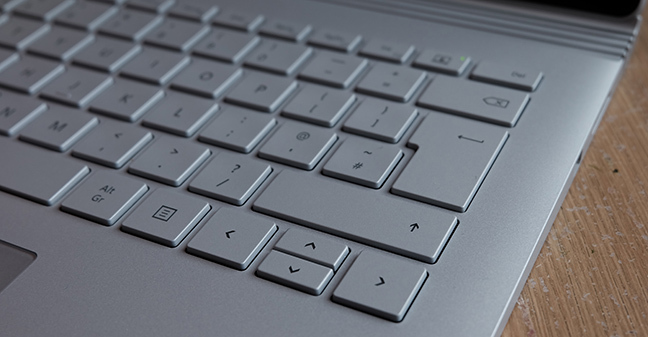 The keyboard houses its own Mini Display port, an SD card slot, and two USB 3.0 ports. The keyboard is where you charge this critter, although both keyboard and "clipboard" have their own batteries. More of that in a moment. Like the display it hosts, the keyboard is made of a magnesium alloy that feels slightly other worldly. It's like a metal, but is too light to be a metal (it really is a metal, though). My only grumbles with it are that there's no island for a set of Home/End/PgUp/PgDn keys. Microsoft reserves the two brightness keys for dimming the backlit keyboard – you have to use Fn + Delete and Fn + Backspace to control the screen brightness. 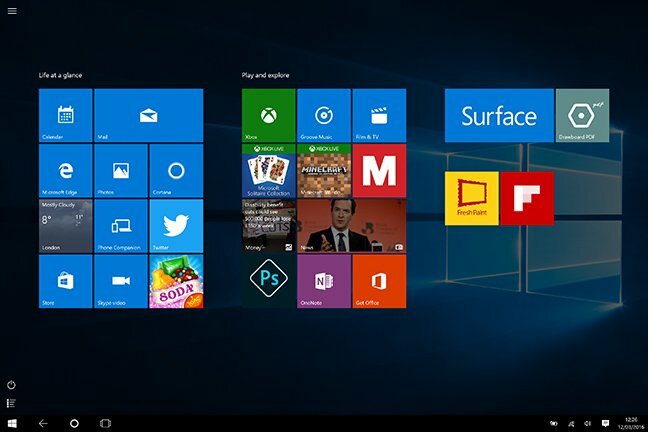 As with Google and Nexus, Microsoft gets to control the entire experience – no OEM crapware. Except you do get Flipboard and Candy Crush Soda Saga, and possibly some other stuff you didn't want. Microsoft tells me that the Surface Book should last for 12 hours. And here it gets complicated, because it's very hard to tell. 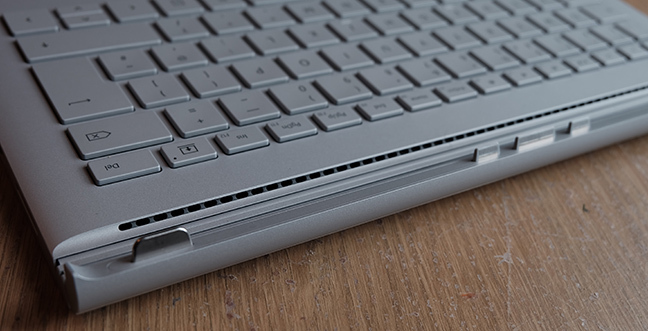 Officially, the Surface Book discharges the capacity of the base-keyboard part first, then only when the base is low, taps into the display battery's power reservoir. Charging, it's the other way around, mostly: it charges the display part first and the base a little bit too. The reality is that based on the instrumentation, it's hard to tell. The Surface Book takes its time giving you a report on how much time you've got left. One factor is that when clipped together, the Nvidia card is in use, which saps more power. Much more so, obviously, if you're gaming. I found the power reporting let things down generally. Not only is it reluctant to give you an estimate, but the estimates vary wildly. The second screenshot is taken a few minutes after the first, with no change in workload or screen brightness. Surface wouldn't be Surface without a few glitches. The first time I used the Eject button, it released the Display portion with a satisfying click. (Which is actually an audio file). And it worked the second time. But it hasn't worked once since. Infuriatingly, Surface Book wouldn't tell you what was causing it to maintain its Rottweiler grip on the display, the red LED merely indicating that you shouldn't. You can do a Vulcan nerve pinch to reset everything but it requires a reboot. Here's another, something the latest version of Photoshop caught. The Nvidia card actually has 1GB of RAM, but Photoshop is confused. This is the top-of-the-range model, but newer Intel chips are now available because it's taken so long for a UK Surface Book to... uh, Surface. I liked my time with the Surface Book, and grew to like it more as I got used to the heft and quirks. But with top performance and outstanding features in convertibles half the price, you really are paying a premium for Surface exclusivity that might make Apple blush. 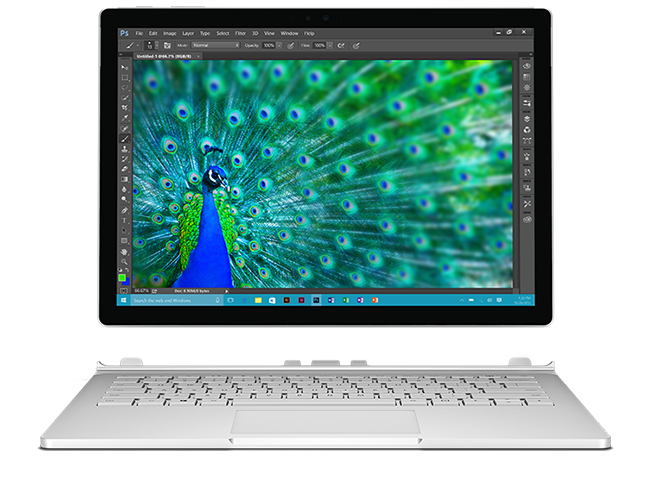 Microsoft's specifications for the Surface Book and ordering details are available here.